Sinthan Top connects Kashmir valley with Jammu Province through Kistwar. It is 12,500 feet (3,800 m) above sea level and is snow-capped for most of the year. It is located at 33°34'N and 75°30'E at the Anantnag-Kokernag-Kishtwar NH1B Highway, and is 130 km south of Srinagar and 73 km from Anantnag and 48 km from Kokernag. Sinthan Top has no local population. Shepherds from adjoining places like Kokernag, Duksum, and tourists and those working in the tourism industry may stay overnight in tents. Sinthan Top is known for its beauty and wonderful tourist attractions. The place is fast growing as one of the top tourist destination in Kashmir. Around 37 kilometers of snaky and uphill drive from Daksum, it offers an adventurous journey. The spot is emerging for mountaineering, trekking and skiing. 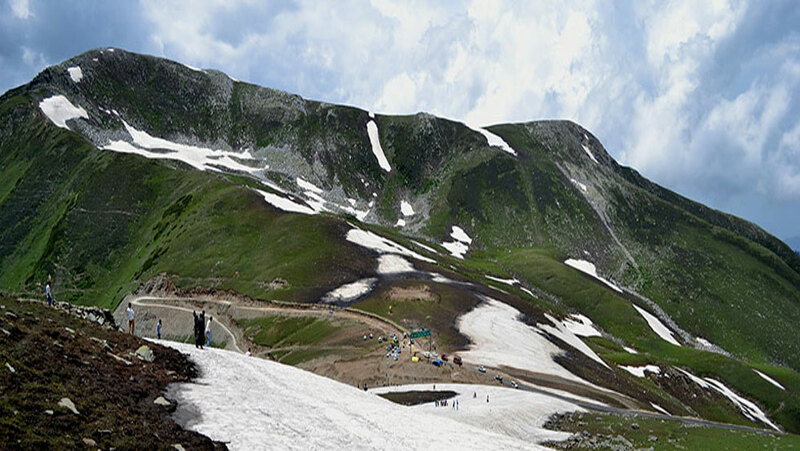 Sinthan Top is easily accessible from Srinagar, almost 4–5 hours drive by car. Attractions like Kokernag, Dacksum and Achabal fall en-route that offer tourists varied choice of resting and makes traveling more pleasant and less tiresome. At the spot called '360 Degree View', one can see areas of both Kashmir and Jammu Divisions. Also the spot itself can be a great resting place for people traveling from Srinagar to Kishtwar or Doda and back. Sinthan Top is the South-East end of Breng Valley (The Golden Crown of Kashmir)and is 48 km from famous Kokernag spring. The nearest hotels are located at Kokernag and Daksum ranging from extremely budget accommodation in private and Government huts to deluxe hotels. One should be able to book a night in a hotel or hut between rupess 1500 to 3500. One can plan to visit Lihinwan and the famous Margan Top in the Margan Valley and Inshan which are located in the same area.